The Beluga J32 is the second sailing yacht launched by Beluga Yachting. The first yacht, the Beluga J39 (previously the Jobbe 39), is well thought-out and has been praised for her elegance. 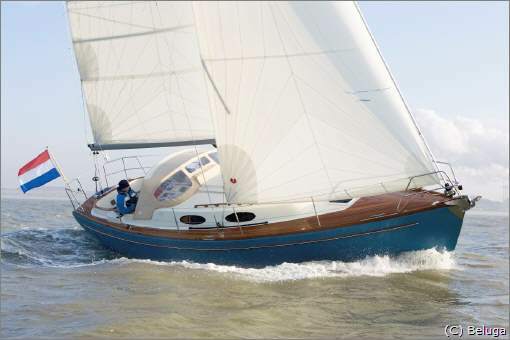 This 32-er shows a similar sophisticated classical line with an elegant sheer and a positive stern. It is a seaworthy yacht that can easily be sailed by one person as all halyards and sheets are operated from the cockpit. Inside the Beluga J32, space has been used optimally leaving room for a spacious second hut at the back athwart ships. When in the water, the Beluga J32 shows her modern side. It sails calm and can be operated comfortable from within the large and well protected cockpit. The yacht keeps its course and speed because of its sturdy hull and the design of its bottom. Good quality materials are used both on the upper as well as on the lower deck. For the interior, materials of a similar quality are used. 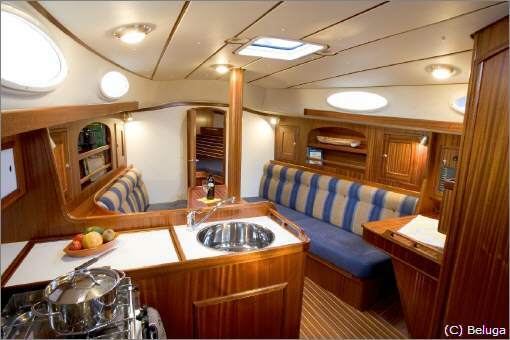 Specially selected mahogany gives the interior an attractive feel. The interior has a perfect finish and is well thought-out, from practical handles through to drawers and full headroom. The Beluga J32 has a nice saloon with a galley and map table for navigation, two spacious huts, one in the front and one in the back, and a good size wet cubicle. 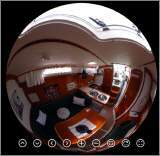 All in all a well designed yacht suitable for longer trips. The Beluga J32 is delivered with CE certificate Class A, Ocean. All Beluga yachts are built together with the client. Each new yacht will be optimally complied with the wishes of the customer. Beluga Yachting is a true Dutch shipyard characterized by its quality, attention to detail and originality. Beluga Yachting is a Dutch shipyard. Job Verheijen is the designer of the yachts, which are also built by Beluga Yachting. The in-house combination of the design and construction of the yachts makes Beluga Yachting unique. Job Verheijen has a long sailing history and a successful sailing career (European Championship sports boat, Dutch Championship J22 and reached the top ten in several World Championships). 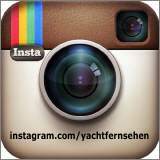 He has a degree in higher technical business administration and higher naval architecture. During his studies he worked for North Sails in New Zealand on the campaign of Team New Zealand for the America’s Cup. Beluga Yachting’s first design is the Beluga 30, a classical lined motor yacht. In the meantime, the Beluga 35 has been built as well as the first sailing yacht, the Beluga J39. Through the years, Beluga Yachting has become a full-service shipyard; new built yachts, maintenance or refits, Beluga Yachting does it all with care and attention.